Purchase the selected F&N products worth at least RM5 in single receipt. 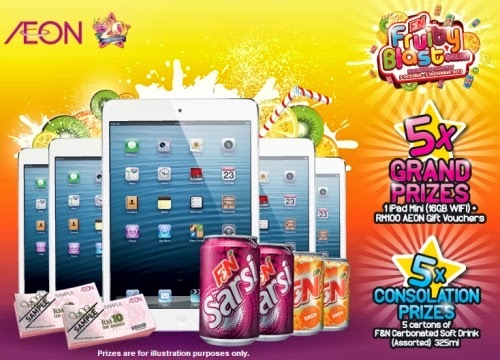 Click the “F&N Fruity Blast @ AEON” app at the AEON Retail Malaysia Facebook page to access to the contest. Like the AEON Retail Malaysia Facebook Page to be our fan. Insert the receipt number on the receipt which you get from the purchase of the selected F&N products during the contest period. Each receipt number can allow participant to try playing for 2 times.